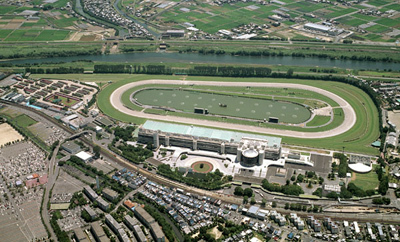 Built in 1924, Kyoto Racecourse is the premier racecourse of Western Japan. 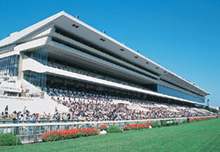 Kyoto Racecourse holds the same number of race meetings as other major racecourses, with five meetings a year. (Each race meeting usually has six to twelve days.) The major races are the Tenno Sho (Spring) (G1), the Kikuka Sho (Japanese St. Leger) (G1), the Mile Championship (G1), the Queen Elizabeth II Cup (G1) and the Shuka Sho (G1). Approx. 5 minutes on foot from Keihan Dentetsu Yodo Station. Approx. 20 minutes by nonstop bus from JR Yamazaki Station. Approx. 20 minutes by bus from Hankyu Dentetsu (Railway) Minase Station. Buses (fare charged) run between Kyoto Racecourse and JR Yamazaki Station and Hankyu Dentetsu Minase Station every Saturday and Sunday while races are held.